We all know that incredible feeling after working out. The muscles are tired and after a while the body enjoys the released endorphins. Physical activity is an important part of being healthy for both humans and dogs. Most dog owners’ only walks their dog, but a run or a bike ride should also be considered an option. In this small article I will give some advice on how to get started running or cycling with your dog. Both you and the dog will benefit greatly from this. 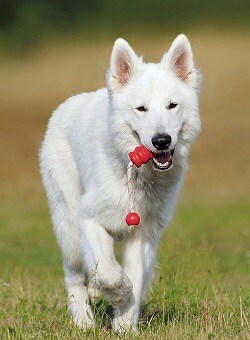 Cycling and jogging is perfect for the German Shepherd Dog. However the dog must be. Fully grown – i.e. at least 1-1½ years old. It can actually be harmful to dogs if they are not fully developed. Overworked muscles, bones, ligaments and tendons is not a good thing for a puppy. Must be healthy – and sufficiently fed. Overweight dogs should lose the extra pounds first. If you are unsure if your dog is able to go for a run, check with your vet first! When a human starts working out, and important tips is to start slow, and do not push yourself too much. This is no different for a dog. The pace should not be faster than the dog only jogs besides you – no matter whether you’re biking or jogging. The jog is the most natural gait, especially over long distances, which adds the least amount of strain on the dog’s body. You should avoid the jog sprinting, unless it runs on soft soil (like grass) and it only does so on a short distance. Start walking for a few minutes to warm up (here the dog will most likely pee), then run for 1 minute, and then walk for 2 minutes. Repeat this throughout the trip which could be around 20 minutes. Repeat this exercise 2-3 times during the first week or two. As both you and the German shepherd gets in better shape, you reduce the walking to 1 minute, while you continue running for 1 minute. Run in a pace where you are still able to talk with your dog. Usually the dog is the one in best shape – but if that is not the case, keep an eye on the dog whilst running. The dog will not stop because it’s tired, it will keep running even though it strains its body. So keep an eye on the dog, to ensure that it does not push itself too much. Over time you can change the distribution between walking / running, or simply start running the entire trip. But a few minutes of walking is great for warming up the muscles, and it gives the dog a possibility to empty its bladder. Running next to a bicycle is a harder, than actually riding the bike – remember that! You should therefore follow an interval training program (described above) and start with short trips, every second or every third day. The pace should not be higher than the dog only jogs besides you – whether you’re biking or running. You should avoid the dog sprinting, unless it runs on soft soil and it only does so on a short distance. Find a suitable route without disrupting traffic. Get the German shepherd comfortable with the bike. Keep the bike on your right side (holding in with your left hand), and get the dog walking on the right side of the bike. Then start slowly walking whilst praising the dog – keep ensuring the dog following the bikes direction. Try to make soft left and right turns, while you encourage / lure the dog to follow you. It takes practice to be able to handle both dog and bike whilst walking. It is easier when you sit on the bike. When the dog is comfortable with the bike, and can naturally follow you and the bike when turning both right, left and about – then it is time to jump in the saddle. Get the dog’s attention and start to bike slowly. Do not make any sharp turns, and praise the dog just by following you. For security reasons, it is a good idea to teach the dog to sit (on your right) when you stop. Therefore, the moment you stop cycling, say “Sit” and praise the dog. When the dog is familiar with running besides the bike, you can gradually start biking in more populated areas. NOTE: The dog must always run on the right side – away from traffic. Turn the dog’ collar upside down when cycling. Keep the dogs leash in the right hand, but do not hold your bike with this hand as well. If the dog stops or start pulling, it is much easier to recover faster balance by having this hand free from the handlebars. In the warm period of the year it is advantageous to both cycle and jog early in the mornings or late at night. It is more comfortable, for both the dog and owner. Remember to bring water on the trip if the dog must jog or bike a longer distance. The dog does not sweat through the skin as humans do, instead the “additional” heat is expelled by rapid breathing and emit heat though its tongue. Bring water on the trip, and restore the dog’s cooling system if needed. ATTENTION! Do not feed the dog (treats or small pieces of food is OK) a few hours before and after the run, to reduce the risk of the stomach turning. Asphalt is hard for the dog’s body and the asphalt surface can also be very warm on sunny days. Grass and ground paths are therefore preferable. Plan the exercise, so that you do not need to leave the dog immediately after the exercise. The dog may seem physically tired, but due to adrenaline in the blood it is still in an “alert”-state. Dogs with domestic problems (separation anxiety) will be even more likely to be unhappy and destroy your house. Let the dog settle down for about 20 minutes before leaving it. It is important that there is a reasonable balance between physical activity (exercise) and mental stimulation – and the dog needs both. You can benefit from using dog food to various brain exercises. When the dog uses its sense of smell, it needs a lot of energy to analyze the olfactory, and the dog becomes mentally tired. All kinds of search exercises (food, toys, people, track-search etc.) have this effect. Training and learning new exercises also exercises the German shepherd’ brain. Remember to vary the dog’s activities by combining physical and mental workouts. German Shepherd Weight – Don’t Make It An Issue!